Although I tend to lean toward darker imagery, I do sometimes make pictures with a lighter feel. Fairy Friend made it onto Facebook. It had attribution on it, but was hard to see owing to FB's formatting of the picture. Just FYI. I don't suppose any of these works are available in poster form, are they? She could ride the kitty into battle! OMG ITS CAT! I want one... no I want this cat! Just stumbled on your work,oh my goodness wow I think this gorgeous & I have to say outstanding work on this. This is pure awesomeness. I love cats, I love fairies, I love size difference concepts... and I love adorableness too. This ticks a LOT of checkboxes and happens to be really well executed to boot! Reminds me of our old cat who just turned 19 years old. The level of adorableness in this is OFF THE SCALE!! Wow, such a lovely artwork. Faerie's Companion gets +1/+1 as long as you control a Faerie. If anyone asks "Who is happier here": Both are. Whoa, how gorgeous.. have a watch! This should be a daily deviation. 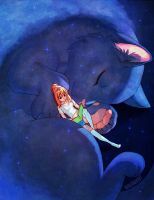 Awwwwww...am I the only one who wants to imagine that it's the cat who is enormous, rather than the fairy that is tiny? I love the expressions on their faces...so sweet and loving! I can almost hear the purr the instant I click on it. Yeah...the flowers do make it clear what size it's "supposed" to be. But...but...I WANNA GIANT KITTY!!!! She has a few more similar giant/tiny pics in her gallery. Awwww...while I am not normally much of an anime fan, that is a great find. Looks like Heaven!